MaxCadd provides highly-edged comprehensive Engineering Design and Manufacturing services to enhance customer success globally, in creating wide range of innovative Designs & Manufacturing Solutions. MaxCadd has a team of qualified Professionals with extreme potential skills to serve the customers globally by addressing their engineering challenges and requirements through wide range of Engineering Design solutions and services, which includes Conceptual designs, Reverse Engineering, Meshing, Product Design, 3D Modeling and Drafting, Legacy Data Migration, Design & Development of Sheetmetal Components, Mechanisms and Animations, BOM Managements, Rendering and Engineering Analysis (FEA & CFD) to those who depend on the engineering sectors namely Automotive, Heavy Equipments, Aerospace & Defence, Rail, Material Handling Equipments, Construction Equipments, Agricultural Machineries, Biomedical Devices, Consumer Products, Architectural & Civil Engineering Services. The values and services from maxCadd spreads across various branch of engineering and no matter in which platform the customer is engaged, we at MaxCadd mediate to examine and give out ideas through our cross functional team. 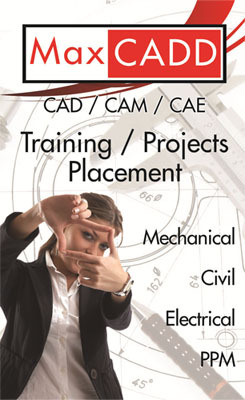 Experienced specialists with a solid professional background are working in the MaxCadd. This enables the animation company to accomplish assignments using a large variety of styles and work techniques and to effectively solve virtually every task set. Experience and professionalism of our specialists combined with a large number of challenging projects successfully finished serve as a guarantee for top quality CAD design and maximum speed in effectuation of assignments.